This was the first idea I had upon learning what this month’s theme was. Saline the Salt Lake Queen is one of my absolute favorite songs to listen to while baking, for obvious reasons. I had just recently tasted the magnificence that is smoked sea salt, and how EXTRA magnificent it is with chocolate. Oh so good. It goes with a lot of things though, and is something I am thrilled to add to my arsenal of fall-friendly ingredients. I have SO MANY PLANS for it, guys. 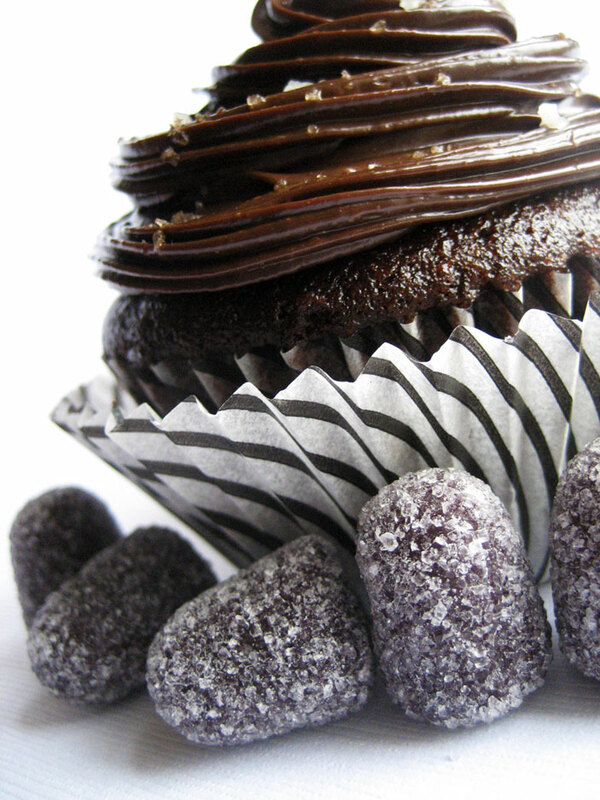 The candy has nothing to do with the cupcake, they just looked nice next to it. 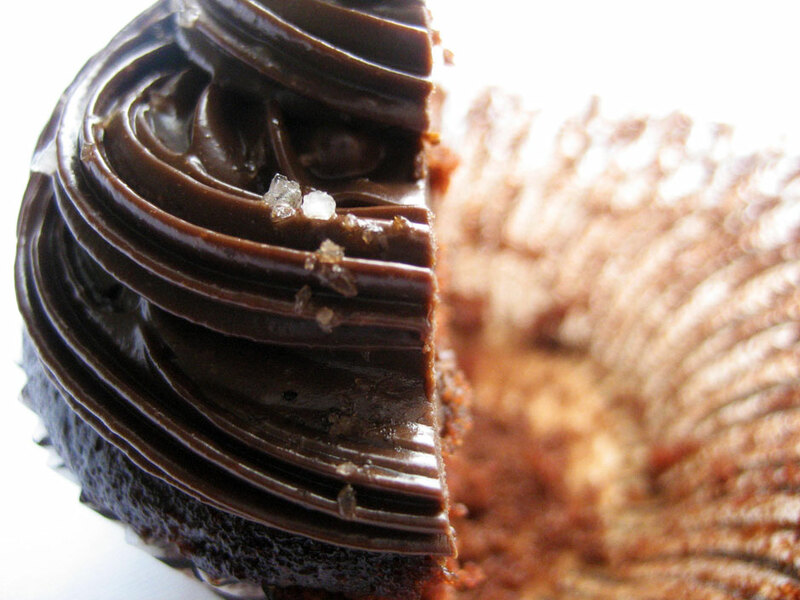 I thought that a gooey, smoky, salty chocolate cupcake would be a perfect tribute to the song, with the smokiness playing well into the desolate, crater-riddled landscape that the Salt Lake Queen inhabits. Same goes for the licorice...though I guess licorice is commonly salted. I originally was going to use a very bitter 86% cacao chocolate for the ganache but since I made the ganache a bit early and had to refrigerate it overnight, it broke when I was trying to reheat it. Oil leaking everywhere does not a tasty frosting make. I didn’t know what to do so I started over a couple days later with some less intense chocolate I happened to have on hand, but I’m not sure what percentage it is (just received a giant block in a goodie bag from a school event I volunteered to help with). It made a very silky, delicious ganache though. You can go as dark as you’d like but I wouldn’t go too light – I have recently grown very fond of quality milk chocolate but it’s not appropriate here. Where did the other half go? In my tummy, of course! Since the color wasn’t as dark with the second batch of ganache I did add a little black food coloring. I originally though I might dye it darker but I like how it turned out anyway. Make sure you use good quality cocoa powder and chocolate, however dark you decide to go – I used Scharffen Berger cocoa powder and, uh, I have no idea what brand the chocolate in the ganache was. Cacao Barry maybe? We use that at school mostly and the squares had cacao beans on them so that’s a safe guess. ...This half went in my tummy, too, only I waited until after I ate lunch. Along with putting the smoked salt directly into the batter (I kept increasing the amount of salt in the recipe every time I checked it), I sprinkled some on top of the piped ganache, and decorated with a few large crystals of gray Brittany salt, which has a delicate, pure salt taste to it. 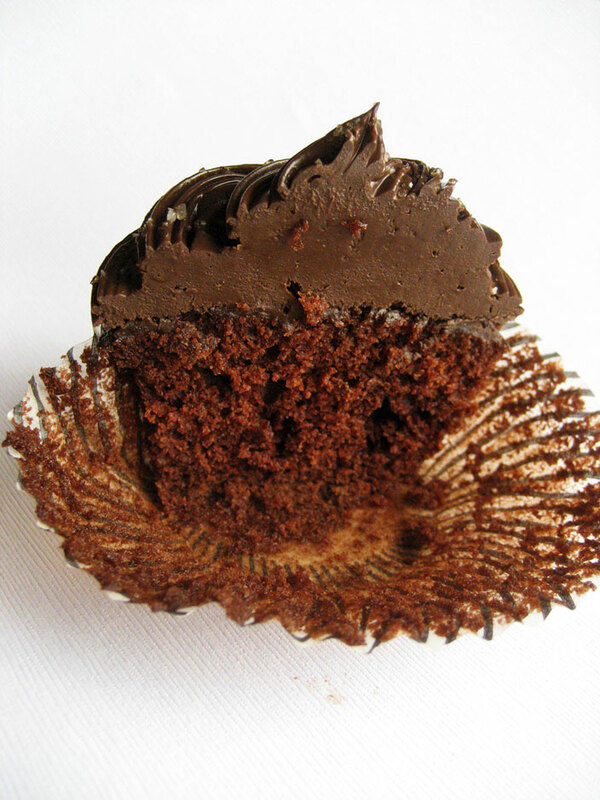 These cupcakes are soft, chocolatey, mysterious from the smokiness and just salty enough. They’re also quite a bit tastier than what I imagine Saline was cooking up in her kitchen among the brutal ruins. Preheat the oven to 350. Pour the water into the cocoa powder and whisk until smooth, then let cool to room temperature. In a separate bowl, whisk together the flour, baking soda, baking powder and salt. Set aside. Cream the butter and sugar until light and fluffy, then add the eggs one at a time, incorporating them fully into the butter mixture. Alternately add the wet and dry mixtures in thirds, beating them in fully before adding more. Once the batter is completely combined and smooth, pour into lined muffin tins and bake for 20-25 minutes, or until a toothpick inserted in the center of one comes out clean. Cool completely before frosting. Makes 15-16 full sized cupcakes. Place the chopped chocolate in a medium heatproof mixing bowl. Heat the cream in a saucepan until it just boils, then pour evenly over the chocolate. Let the mixture sit for up to 30 seconds to allow the chocolate to melt, then, using a whisk, begin slowly stirring from the middle out until all the chocolate is fully melted and emulsified into the cream. If there are any chocolate “chips” left over, you can gently heat the mixture over a double boiler of simmering water, stirring constantly, until everything is melted. If you do that, don’t let it get too hot or your emulsion may break (causing fats to separate and general ickiness). Stir in the food coloring until it’s the right shade of dark, grayish brown. 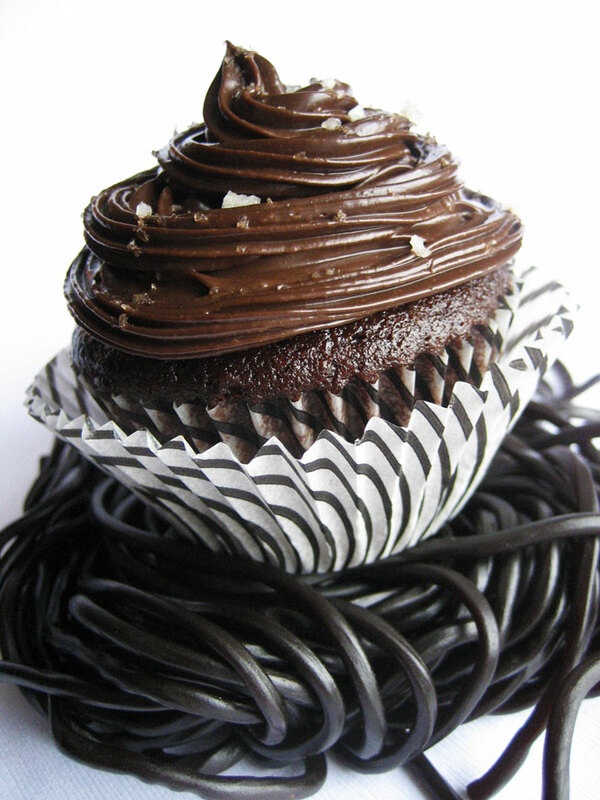 Let the ganache cool to set up a bit, then stir a little to whip up and place in a piping bag fitted with a star tip. Pipe onto cooled cupcakes. 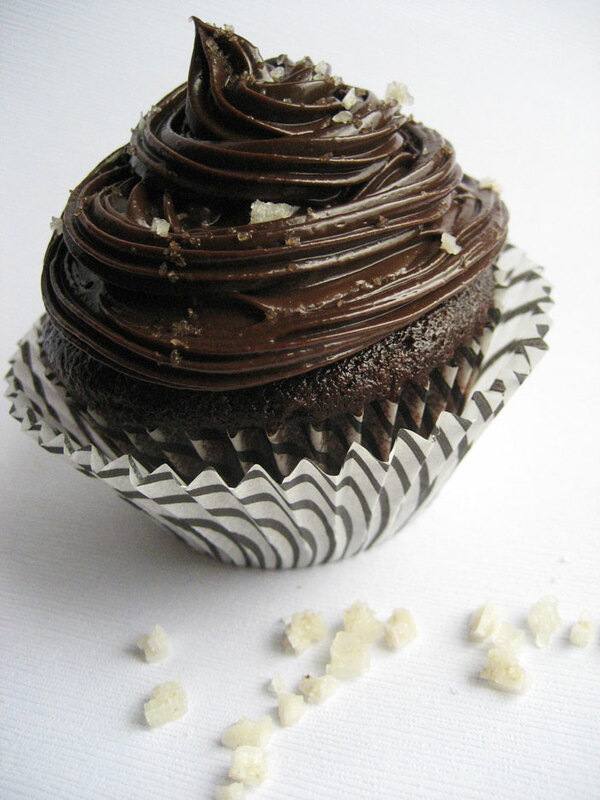 Sprinkle the cupcakes with a little smoked salt (and a few crystals of gray salt if you have it, or any large, crunchy, delicately flavored salt). oooooooo how interesting! sounds so intriguing and I love love LOVE your photos – gorgeous! Dear god, these look absolutely EPIC! Yum! 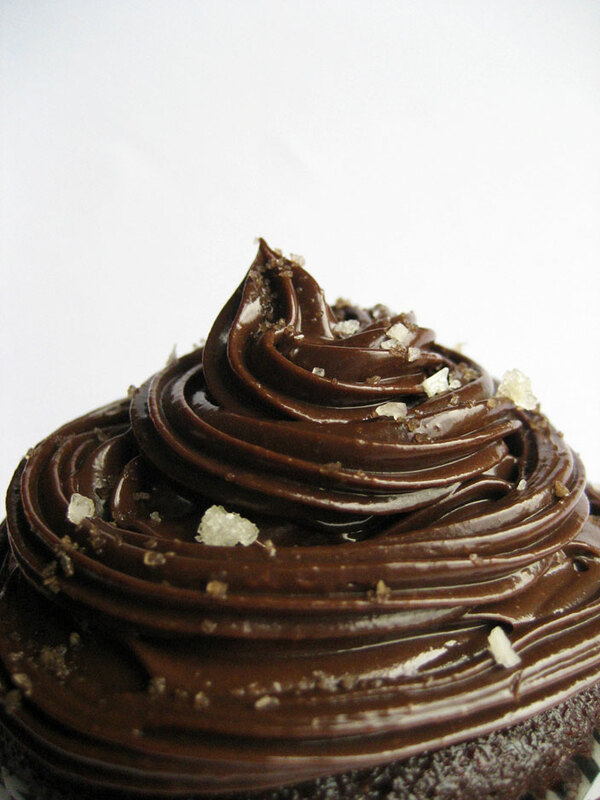 Sea salt + chocolate = unbeatable combo! I can easily eat 2 at 1 go! I love your taste in music AND cupcakes. if your chocolate pieces had pictures of beans on them then it’s probably felchlin. thank you for inspiration so much! this recipe is so lovely! i used it, BUT i made it vegan. i also added a little tiny dollop of peanut butter in the center, for a suprise upon first bite. its seriously the best thing i’ve ever made. anyway, thank you so much for thinking this up. i love combining dark chocolate and salt. so glorious.